Although many companies in the ad tech industry today are becoming increasingly consolidated, there is still a borderline overwhelming amount of programmatic advertising solutions to choose from. 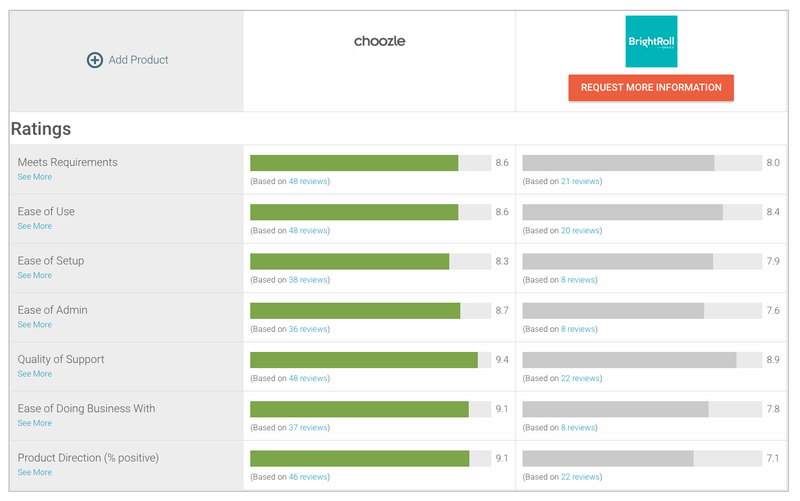 We’ll compare Choozle to a similar Demand-Side Platform (DSP), BrightRoll, based on reviews and a side-by-side comparison from G2 Crowd. One thing that our customers value about using Choozle over other platforms is our dedicated and knowledgeable customer experience team. We love hate to brag, but with an average customer support turnaround time of no more than 48 hours, customers never have to wait more than a couple of days to receive an answer or feedback. During our weekly office hours, we’re happy to take a look at your campaigns for optimization opportunities, and our in-platform education tool Choozle Academy offers easy-to-understand industry and product education at your fingertips! BrightRoll’s main focus is on video advertising, and since they’re owned by Yahoo, that means there is an impressive amount of that inventory available. However, at Choozle, you’ll have access to more programmatic advertising inventory spanning across display, video, mobile, and more all from a single, intuitive interface. On the same note, most other Demand-Side Platforms often require lengthy contracts and minimums making it hard to run tests across different mediums, creatives, and audiences. Although BrightRoll is regarded as being a great option for awareness campaigns, Choozle’s detailed targeting options – like our contextual keyword library – offer advanced tactics to even the most independent self-service clients. This gives complete control and transparency into building several different types of custom audiences, as well as the ability to A/B test new or different tactics depending on your desired outcome(s).